Excursion to Tower Hamlets Cemetery Park, by Jane McChrystal. It was the second Sunday in January and people were emerging from the cocoon of the long holiday to take a walk along the Thames Path. The grey skies and a chill in the damp air seemed to signal the right conditions for me to head north from the Isle of Dogs and explore Tower Hamlets Cemetery Park. The local authority responsible for its upkeep is keen to promote the Park as a nature reserve and raise its profile as a centre of conservation and education. It remains, nonetheless, the resting place of 350,000 East Enders buried there between 1841 and 1966. The Park, or Bow Cemetery as it was known originally, is one of the Magnificent Seven, a group of cemeteries established outside London by an act of Parliament passed in 1832. The problem of burying the London dead had been troubling architects since the Seventeenth Century. Wren and Vanbrugh both predicted that interring large numbers of bodies in the small yards surrounding London’s churches would eventually lead to awful consequences. Their concerns became a reality in the early Nineteenth Century, when epidemics began to spread through London as the water supply became contaminated with leakages of decaying matter from the overcrowded church yards, the result of a dramatic increase in the population from 1 million to 2.3 million over fifty years. The act was designed to encourage private companies to set up new cemeteries where families could buy a plot and bury their dead, safe in the knowledge that they would stay there for eternity, rather than being dug up at some point in the future for disposal who-knows-where, a common practice at that time when church burial grounds filled up. Fine new cemeteries appeared in Highgate, Abney Park, Brompton, West Norwood, Kensal Green, Nunhead and Bow. With their newly planted trees and carefully laid paths, they offered future generations of Londoners a peaceful place to contemplate the loss of people they had loved. Tower Hamlets Cemetery Park is bound by Burdett Road, Mile End Road, the c2c railway line connecting Fenchurch Street to Southend and Bow Common Lane. It’s a busy urban environment and, on approach from Burdett Road along Hamlets Way, the landscape forms a typical East End scene with its Frozen Fish Bazar (sic), Euro Halal Cash and Carry, rubbish piled up outside a letting agent’s shopfront, rows of low-rise, nondescript social housing and the odd glimpse of gentrification caught to the right on Mossford Street, where a terrace of recently renovated Victorian houses has sprouted a single Felicity Lord sales board. This all changes on entering the Cemetery Park: ranks of monumental masonry stand surrounded by woodland, ponds and meadows, where the Friends of the cemetery tend everything to keep a careful balance between the interests of nature-lovers and people like me in search of East London’s history. Tower Hamlets Cemetery Park shows a very different version of London history to the one presented by members of the Magnificent Seven located in more affluent areas. For example, Highgate shelters the graves of Karl Marx, Michael Faraday, Christina Rosetti, Sheila Gish, Patrick Caulfield, Ralph Milliband and George Michael within its boundaries. The Cemetery Park has no political theorists, scientists, artists, poets or celebrities to burnish its reputation. The individuals buried in Bow Cemetery represent the story of a struggle against indigence and social deprivation, unknown lives lived at sea, the destruction unleashed by war and the necessity to have a good time when fortune allows. One significant part of the East End’s history is absent, the lives of Jewish people swept into the East End by the by the pogroms perpetrated in the Russian Empire under Tsar Alexander III. Like the Roman Catholic members of the population the Jewish community maintained their own burial grounds elsewhere. Not all East End lives were trials of endurance and poverty. Joseph Westwood owned a foundry on the Isle of Dogs which constructed ironwork for engineering projects around the world, such as the Attock Bridge, built in1880 to connect the Punjab to the Pashtun region across the Indus River and form a vital line of supply for British colonists. Westwood chose to live among the people who laboured for him, though separate from them, in a substantial villa on Bow Road called Tredagar House. The site of the house later became one of London’s first schools of nursing, which is now a block of luxury flats. 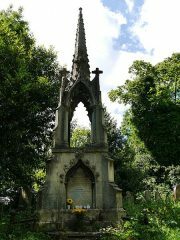 He died in 1883 and is buried under the largest family memorial in the cemetery, a grade two-listed spire carved out of Portland stone, which overshadows the surrounding monuments, put up by other less-moneyed Victorians who expressed their enthusiasm for gothic revival with draped urns, grieving angels, broken columns and anchors set loose from ruptured chains. Still, it is the graves of the philanthropists, political activists, war dead and ordinary people, which hold a better-known story of the East End. Miss Clara Grant, “the bundle woman of Bow”, is buried a short walk away from Knapp road and the primary school which bears her name. She was a pioneering head-mistress who believed her pupils deserved to discover the joy of learning, rather than being the objects of the kind of gradgrindian education deemed good enough for children in training for a life of servitude. Aware that hungry, cold children cannot benefit from any kind of education, she set up the Fern Street settlement in 1911 for the aid of poor families and it stands there to this day for the same purpose. Not a very slick slogan, but press reports and photos of the little children waiting in line to claim their prizes made a powerful appeal to the sympathies of readers who were potential donors to Miss Grant’s causes. They built prayer and reading rooms and provided classes in seamanship for sailors in the hope of drawing them away from the temptations of Sailor town on the Radcliffe Highway with its many boozers and brothels. Their language of doing good might sound pious and even patronising to us, but sailors on a spree after months at sea were often fathers of families in urgent need of their pay. The Mission is still there on the East India Dock Road and is now known as Queen Victoria Seamen’s Rest. Close to the Roes’ grave is that of William Crooks, first Labour MP for Woolwich. Crooks started out as a casual labourer in the dockyards who became a campaigner for the welfare of his fellow workers and a leader of the 1889 Dockers’ strike. The strike was a landmark in the history of the trade union movement, which resulted in agreement to a minimum wage, the “Dockers’ tanner” and led to the formation of the first powerful, industrial union in Britain. To the left of his grave, a sober, rather modernist brick construction, erected to honour the one hundred and forty people who died in Poplar between 1940 and 1944, reminds visitors of the devastation inflicted on civilian populations since the theatre of war expanded from the battlefield, trenches and sea into the air during the First World War. An even more pointless waste of life is commemorated by the presence of the graves of some of the one hundred and seventy three people crushed to death on the stairs of Bethnal Green Underground Station on 3rd March 1943. That evening people were alerted to the possibility of an air raid and, as usual, made their way to shelter in the station. It was rainy and the stairs were slippery. There was no hand rail in the middle of the stairwell, the steps were unmarked and poorly lit. According to witnesses, the disaster occurred when a young woman with her baby stumbled, followed by the fall of an elderly man which created a domino effect in the press of bodies on the stairs. There was no time even to panic. The alarms were false and no raid took place that night. The potential of such a catastrophe to undermine the nation’s commitment to war was so great that the government banned reports of its location and the number of casualties from the news. Survivors, rescuers and bystanders were discouraged from talking about it. But after the War, the people of the East End were lifted up by the same waves of increased prosperity and social improvement which buoyed the rest of London in the sixties, and some of the last individuals buried in the Cemetery Park reached a “good age”. Their families could even afford to employ a local mason to mark their final resting place with distinctive headstones composed of a heart-shape carved out of an arch enclosing an urn. Finally, there is the grave of Charlie Brown, publican of the Railway Tavern, an ex-boxer and “uncrowned king of Limehouse”. He was renowned throughout the East End as a benefactor, snappy dresser and collector of exotic objects for the walls of the pub, which his seafaring clients brought from the Far East and Polynesia. He died aged 72 in 1932. At this distance it’s hard to pin down the precise nature of his charisma, but his funeral demonstrates its magnitude. It was attended by 16,000 mourners including the Mayor of Poplar and, bafflingly, Members of the Ancient Order of Druids. The police were drafted in to keep order, but the crowd’s respect for the Big Man held it in check, even after his death. Bow Cemetery received the people of the East End for a hundred and twenty five years. It’s foundation in 1841 provided a local solution to a London-wide public health emergency, but it was already being overtaken in 1875 by a kind of “super-cemetery”, established four miles further east on farmland at Manor Park, which remains in use today. The exodus of generations succeeding those buried in Bow Cemetery to Essex, Kent and beyond, means that a very particular way of life marked by enormous hardship during an age of tumult, has almost disappeared. Tower Hamlets Park Cemetery leaves us with a record of their struggles, even as the first signs of gentrification appear in the streets round about and the towers of Canary Wharf and the City have come to dominate its skyline to the South and to the West.